Push yourself and your workout as far as you can. Then, push further. THE ORIGINAL PRE-WORK IGNITER. JUST GOT BETTER. 275mg of caffeine, 1.8g of Beta-Alanine, and unrivaled focus. Get ready to slam plates longer and workout harder. 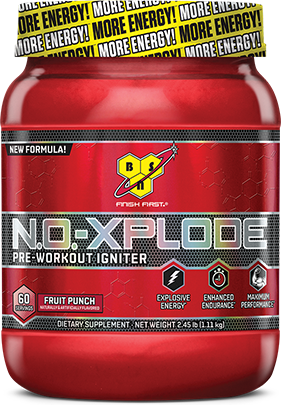 BSN® has re-ignited N.O.-XPLODE®, the first complete pre-workout that launched in 2004 and has been helping athletes break through barriers ever since. Now with more energy, more feel, more focus, and amazing taste. The weights won’t know what hit them. HOW WILL N.O.-XPLODE® ENHANCE MY WORKOUT? N.O.-XPLODE® is a pre-training igniter designed for athletes of all levels to help maximize workout performance. To achieve the most effective training session, both mental and physical energy are a must. Focus is then needed to harness this energy and drive a strong mind-muscle connection. This mind-muscle connection will help you achieve a greater workout intensity, enhanced strength*, and will help you push your body past previous limits. A complete pre-workout supplement should support all of these benefits. N.O.-XPLODE® was designed with advanced ingredient technology to help deliver increased energy and endurance, support mental focus and muscular strength*, and provide second-to-none intensity and performance. BSN® has enhanced N.O.-XPLODE® to provide the formula you need to take your workout to new levels. Now with 275mg of caffeine, N.O.-XPLODE® will give you the energy and focus needed to help maximize every minute of your workout. BSN has enhanced the Thermic Energy blend so you can push your workout intensity to new levels. Muscular strength, power and endurance are supported by creatine in the body. The innovative ingredient technology of our Myogenic Matrix™, featuring an advanced creatine blend, helps every athlete reach their goal of maximizing performance. ‡ Percent Daily Values are based on a 2,000 calorie diet. Directions For N.O.-Xplode: Mix 1 scoop with 4-6 fl oz of cold water and consume 20-30 minutes before training. Do not shake. Stir. CONSULT YOUR PHYSICIAN BEFORE USING THIS PRODUCT IF YOU ARE TAKING ANY MEDICATIONS OR ARE UNDER A PHYSICIAN’S CARE FOR A MEDICAL CONDITION. NOT FOR USE BY THOSE UNDER THE AGE OF 18, WOMEN THAT ARE PREGNANT, TRYING TO GET PREGNANT, OR NURSING, OR THOSE THAT ARE SENSITIVE TO BETA-ALANINE, CAFFEINE OR NIACIN. DO NOT CONSUME CAFFEINE FROM OTHER SOURCES WHILE TAKING THIS PRODUCT AS TOO MUCH CAFFEINE MAY CAUSE NERVOUSNESS, IRRITABILITY, SLEEPLESSNESS, AND OCCASIONALLY RAPID HEARTBEAT. BETA-ALANINE AND NIACIN MAY CAUSE A HARMLESS, TEMPORARY TINGLING OR FLUSHING SENSATION. Do not combine with alcohol. Do not exceed 2 scoops within 24 hours, consumed at least 4 hours apart. Consume as part of a healthy diet and exercise program, and drink at least 100 fl oz of water per day. Exercise may increase your need for additional fluid intake. Keep out of reach of children. Store in a cool, dry place away from direct sunlight. Approximately 275 mg of caffeine per serving.